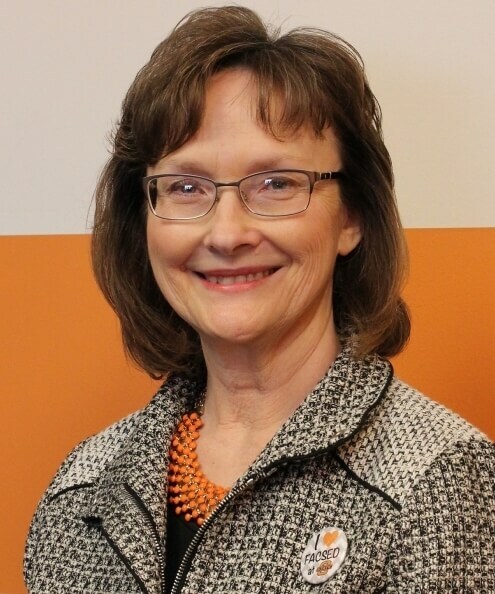 Paula Tripp’s goal at Oklahoma State University is to coordinate the family and consumer sciences education program so that it prepares students to be highly-qualified professionals in public school systems or in the Cooperative Extension Service. Coursework and student activities in the program are designed to provide current and relevant career preparation. In addition to the interdisciplinary coursework students complete, OSU offers specific family and consumer sciences education courses that Tripp teaches so that students are immersed in content with the profession’s historical foundations, numerous and diverse field experiences and rigorous, engaging pedagogical resources for their careers. Tripp's research at OSU has primarily focused on documenting the shortages of teaching and extension professionals in family and consumer sciences education; shortages are projected to continue for several years. Therefore, Tripp frequently visits with secondary students to encourage a family and consumer sciences education career choice so that they will impact future students' quality of life through coursework, the Family, Career and Community Leaders of America and 4-H. In addition, she is part of the innovative Family and Consumer Sciences Education Academy each summer for high school juniors planning to become a family and consumer sciences educator. Tripp has also been involved with classroom lighting and childhood obesity studies. Tripp is the current co-vice-president of the Oklahoma Association of Family and Consumer Sciences and is on the Oklahoma FCCLA Board of Directors. She is an American Association of Family and Consumer Sciences representative to the National Coalition for Family and Consumer Sciences Education. She was recently selected a recipient of FCCLA’s National Distinguished Service Award.